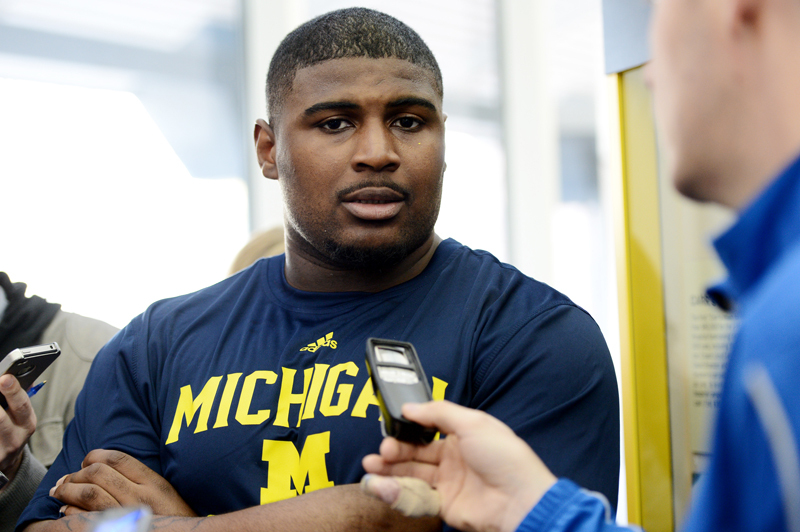 Posted on Sun, Apr 1, 2012 : 5:59 a.m.
Michigan offensive lineman Ricky Barnum, speaking to the media Tuesday at Schembechler Hall, says he's confident he can take over for departed All-American David Molk at center. Ricky Barnum stood there in his Twin Peaks socks, facing a gaggle of media for the first time as center of the Michigan football team. He shifted from side to side, sweat collecting on his forehead, nerves showing. And then he opened his mouth, and any sign of uncertainty melted away. "Jack Miller is very talented," Barnum said, referencing his primary competition for the job. "He’s going to be a great offensive center here in a couple of years. We compete every day. He pushes me, I push him. So, there you have it. He's oozing with confidence, despite all that's stacked against him. Barnum is a fifth-year senior who has played only nine career games, none of which were at center. His last appearance at the position came almost eight years ago, dating to when he was a freshman at Lake Gibson High School in Lakeland, Fla. The guy who he is trying to replace is David Molk, one of the greatest centers ever to play at Michigan. Yet, Barnum isn't worried about any of that. "I don't see it as pretty big shoes to fill, because this is Michigan, and when a class graduates, everybody has to step up, not just one person," Barnum said. Barnum said he's eyed the position for a while now as coaches told him he's a "natural center," perhaps a nod to his 6-foot-3-inch, 297-pound frame. He plans to add five to 10 pounds to complete the transition. "I want to look 300 pounds healthy, not 300 pounds sloppy,” he said. Barnum has played some tackle and guard at Michigan, with most of his recent time coming at left guard. But behind the scenes, he has snapped to quarterback Denard Robinson since he was a freshman. They already have developed a good rapport, with Barnum going as far to say the fellow Floridians developed a "brotherhood" before reaching even the halfway point of spring camp. That leaves plenty of time to iron out the kinks before the Sept. 1 opener against defending national champion Alabama. Still, questions remain. That begins with whether Barnum can even stay on the field, after injuries affected each of his previous seasons in Ann Arbor. He started three games at left guard last season before suffering injuries to both ankles. Michael Schofield took over, and Barnum never started again, even as he returned to health. "I’m a very strong-minded person, so I really didn’t feel down," Barnum said. "I knew Schofield would do a good job, and he did. Schofield brought a lot to the table as well, and I just enjoyed watching him while I healed both of my ankles." This season, Barnum won't have a safety net such as Schofield. Primary Molk backup Rocko Khoury decided not to pursue a fifth year and left the program before spring camp, leaving just the redshirt freshman Miller and walk-on Joey Burzynski behind Barnum at center. That makes it of paramount importance he stays in the lineup. Barnum is doing his part to prevent further injury by working to move his feet better, as well as eliminating his bad habit of standing upright in the hole. He also is getting help from strength and conditioning coach Aaron Wellman, who is trying to stabilize the ankles. Barnum won't be able to match Molk's ability to control the offensive line, nor his high intellect at the position, which he had played is entire life. But a healthy, and confident, Barnum is as good a start as any. Sun, Apr 1, 2012 : 7:39 p.m.
Sun, Apr 1, 2012 : 5:18 p.m. I can't remember a time when we had so many holes across both lines, combined with this schedule. Sun, Apr 1, 2012 : 3:17 p.m. It's nice to continue to hear positive feedback on Barnum at center. I feel pretty confident in the O-line going into fall. It's the D-line that's a bit scary. After watching clips of Saturdays scrimmage and hearing about some of the gaping holes that Fitz and others had to run through, it's a bit unnerving. One can only hope that big Will and Jabreel Black step up and that Pipkins can make an immediate impact in the fall as well. Sep 1st is not a tune up this year! Sun, Apr 1, 2012 : 8:01 p.m.
AZ, I agree with all of that. And I hope a win in that game in cbus puts us in the big 10 championship game. Sun, Apr 1, 2012 : 6:52 p.m.
Alabama is important...but not nearly the most important on the schedule for some of the reasons you've stated. For example, MSU is far more important, imo, because it's a B10 game and, being in the Big House, it's high time to put an end to this 4 year skid. Nebraska will be a huge road game and will give UM a chance to show the Huskers, like PSU before them, that it will be tough to EVER compete for B10 titles when you've got to go through the Wolverines. Finally, by FAR the biggest game on the schedule is @ OSU. It will be Meyer's first game against UM and will be in their backyard...the pressure will be huge on him and his team to come through...and it will be a great chance for UM to crush his spirit and have him contemplating another early 'retirement.' Yeah, the Alabama game is an important tone-setter for the season, but it's certainly not the most important game of the year. Sun, Apr 1, 2012 : 3:28 p.m.
And just as a follow up on the game on Sep 1st. It is my feeling that it is not the most &quot;important&quot; game on the schedule because Bama is not a rival and it is not a conference game. BUT, they will be the best team we will face the entire season. And the importance of that game is increased to do the immediate affect it will have on the confidence of the team whether it be a good or bad outcome. Just my thoughts. Sun, Apr 1, 2012 : 3:15 p.m. I guess the best news is that Barnum's coaches think his problems with injuries are fixable and that they have confidence in his ability to play at center. The next best news is that there's underclassman Miller available as a back up for Barnum. As for bad habits, Ricky Barnum knows how to pick 'em! Standing upright when facing several huge opposing players who are all hunkered down in power stance has got to be a classic in that regard. But just as surely, Barnum seems determined to break that habit and he will have the &quot;help&quot; of one of the finest coaching staffs in the country. Beyond that: it's fitting that prayer campaigns are so popular today. Prayers and good wishes to you, Ricky Barnum. Go Blue!